There’s nothing more fun than trying to capture a pretty cool “sun burst” or “star burst” effect in a photograph. My friend Heather in Denver wrote recently on her blog how she’s been trying to capture the sun as its rays burst through trees. She says she’s happy with the latest result, but needs to keep working on it. Though I usually don’t chase down this effect but there was one opportunity I wasn’t going to miss. This one in particular was at Fisher Towers east of Moab, Utah. 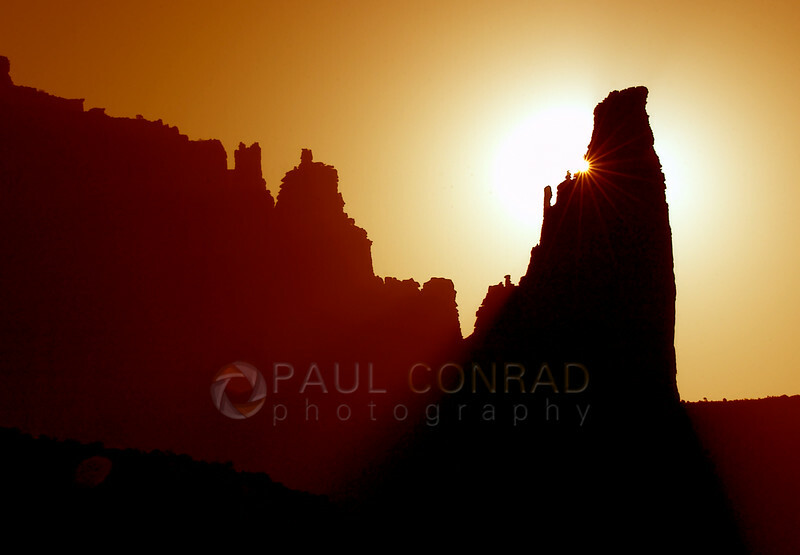 © Paul Conrad/Pablo Conrad Photography – The morning Sun breaks through a crag on The Titan at Fisher Towers near Moab, Utah. It took a little running about as the Sun gained altitude to get into a position to capture the starburst. I had camped overnight on a rock next to a dirt road that led to the camping area and trail head. This was a conscious choice as I left work late the night before and had planned on 3 days of camping near Hurrah Pass in Kane Creek. It was one of those times I threw out my sleeping pad and just crawled into my sleeping bag. No tent. But Mr. Sandman was smacking me with a bag of sand so I turned down the road to find a spot. Unwittingly, it just happened to be the perfect spot in the morning. At sunrise, Ol’ Sol peeked over the ridge and woke me. I got up, set up my camp stove to heat water for some coffee, and while waiting for the water to heat, I noticed how the sun peeked through the crags, crevices, and rocks of the towers and along the cliff edges. I took a quick shot with my 80-200 set at f/22. Looked at the back of my old D1H and zoomed in on the starburst I captured. Without waiting, I shut off the stove and chased the shadow created by The Titan to capture a starburst. The above image is a result of over 30 minutes of work, and walking through gullies, under piñon trees, and being careful of the cryptobiotic soil. The result of my effort is what you see above. One of the few times I intentionally set out to capture a starburst. 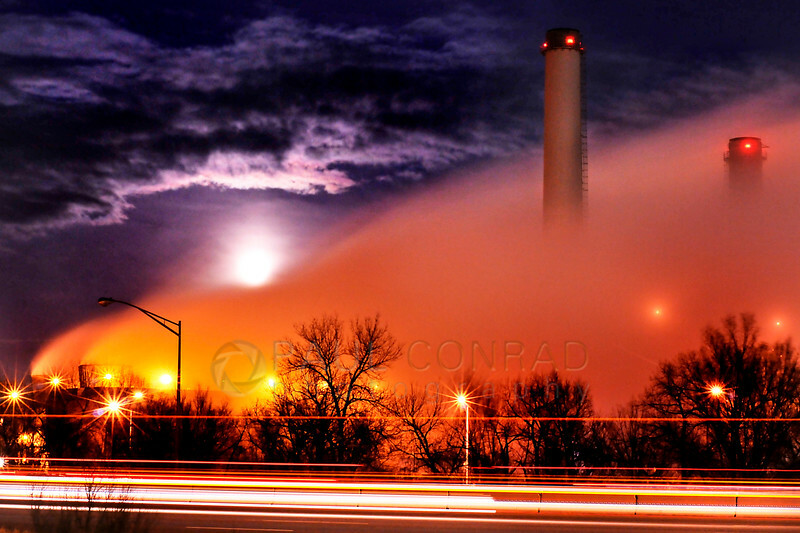 © Paul Conrad/Pablo Conrad Photography – Bitter cold temperatures create massive clouds of steam as the stiff winds blow it from the Martin Drake Power Plant in Colorado Springs, Colo.
4. And patience, patience, lots of patience. One thing about trying to capture a sunburst: you need to be careful not to overexpose as the pinpoint becomes a blob and the rays get washed out. Test various exposures as you’re shooting by varying the shutter speed rather than the aperture. Also, older lenses will give a better star effect and the sunburst looks better. The reason is the aperture blades have straight edges and the new lenses have curved edges. These curved edges form more of a circle than the older ones. The older lenses form a pattern with sharper corners such as a hexagon or octagon, or even a nonagon. 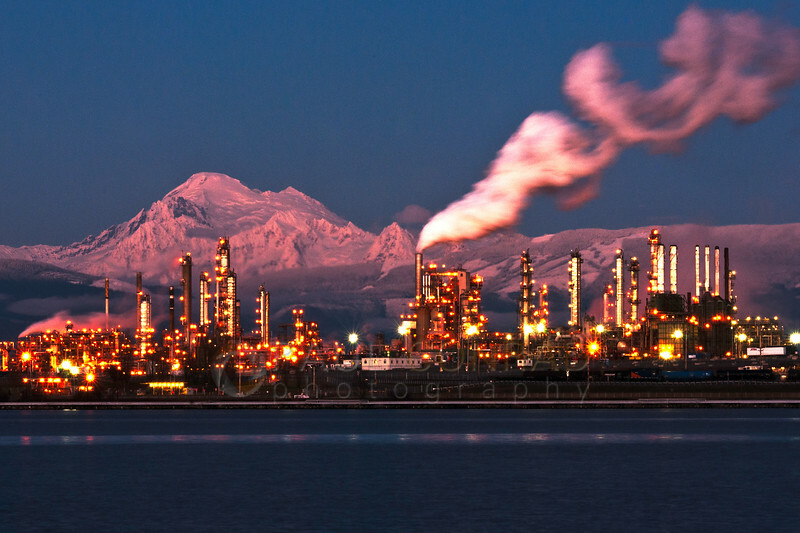 © Paul Conrad/Pablo Conrad Photography – Mount Baker is illuminated by the setting Sun as the lights at the Tesoro refinery in Anacortes, Wash., turn begin to illuminate the petroleum plant. The small aperture of my 80-200 formed the lights into starbursts. When taking photographs of the sun, you must remember to move about and try different angles to capture the starburst. The moving leaves, buds, and flowers, will give you plenty of challenge. Quick Tip: Without your camera, go under a tree and look for the sun. Observe how the moving leaves act as an aperture. Also, move around and see how you can find a spot where the sun is just a pinpoint. Close-up of the strarbursts created by the aperture of the lens fully stopped down. Capturing starbursts/sunbursts is a matter of patience and practice. The only way to learn is to just go out and shoot. Very nice shots Pablo…and good tips too. I’ve been under the weather so I’ve not been online much. Will be getting back with a few new blogs today and tomorrow. The first photograph is phenomenal. Would make a great print for a nice office. I love the mood of it. I love that photo because it reminds me of one of my favorite places: Moab, Utah. It took a lot of running and positioning to get the starburst. Great tutorial and smashing photos, Pablo! I’ll save this one, thank you so much for sharing. As soon as the sun comes out again I’ll follow your tip and go under a tree and look for the sun.